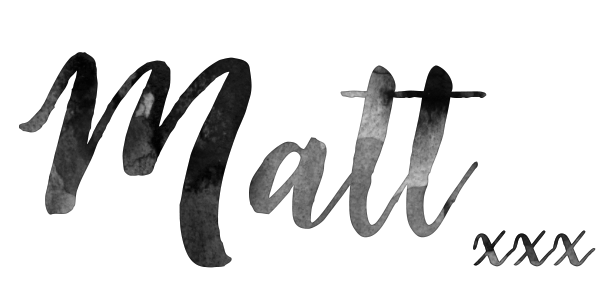 Today's blog post is one that I'm very proud of, a project that I've been working on for a good few weeks and am so insanely happy with not only the process of making this project, but also the final finished product. This project came into my mind last summer when Dennis and I were on vacation in Croatia. 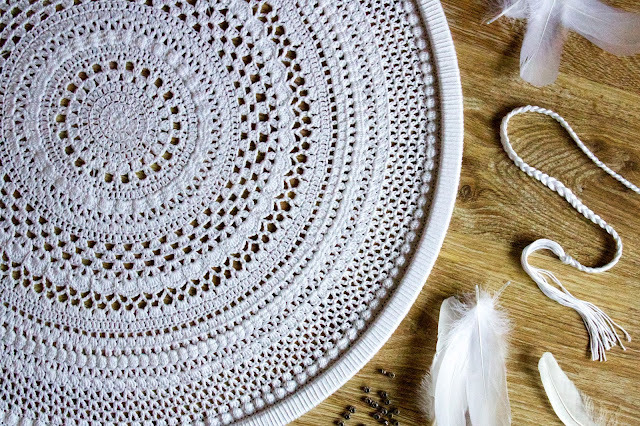 Whilst walking around one of the towns we were visiting, I spotted a beautiful crocheted dreamcatcher and was drawn to it like a moth to a flame. It was totally turquoise and shaped around a large wooden hoop about 70cm in diameter. I was so tempted to buy it, but having had a good look at the rather hefty price tag and looking at the workmanship, I decided that It wasn't worth my hard earned cash and that I would get more enjoyment out of making one for myself. So after things settled with us moving house, I decided to get stuck into working on a new project. Having had a look online I went and bought myself a wooden gymnastics hoop from amazon. This would be the perfect frame for my dreamcatcher. It measures 80cm in diameter, so it's pretty big! I knew that I was going to hang the finished dreamcatcher on the wall in the bedroom. So I wanted it to be fairly large so that it became a feature, a piece of art in the bedroom. 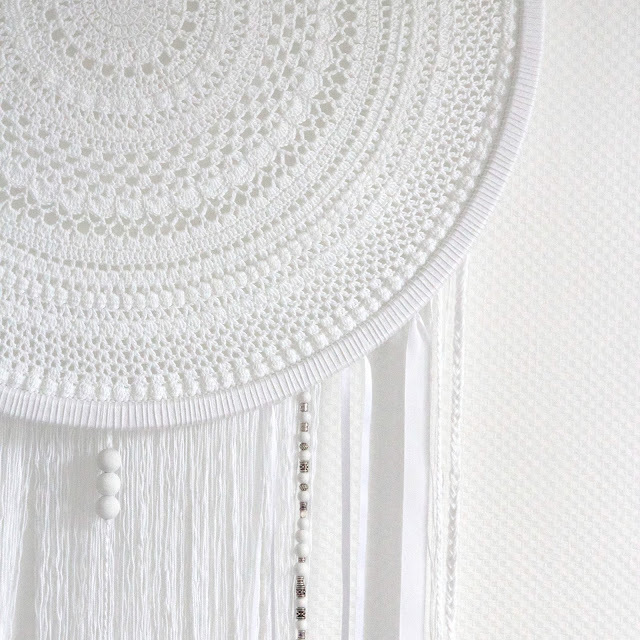 It was to be no ordinary wall hanging, it needed to be a statement! So large definitely seemed the way to go. Once I had received the gymnastic hoop in the mail, I got to work starting the main section of the dreamcatcher. 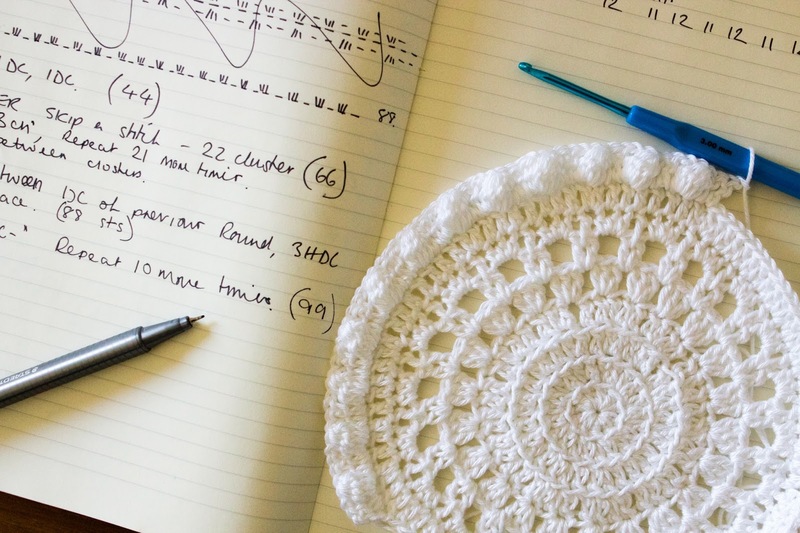 I started working on a crocheted mandala, as opposed to the classic knotted style dreamcatcher and worked each row carefully trying to keep the circle nice and flat, as well as keep track of my stitch count. I used a sport weight cotton from redheart, which I bought from the local garden center (of all places). I jotted down the pattern as I went along, with the hope of sharing a pattern with you all at a later date. The pattern worked well in the beginning, but definitely needs a little revision on the later rounds before its ready to share with you guys. For each round of my mandala I performed the invisible join, trying to make each round look as neat as possible without any obvious start or finishes to the round. Working the mandala in this way meant that I had to sew in ends for each round, a little extra work, but definitely worth the extra time. Each round seemed rather meditative to crochet and ended up being somewhat hypnotic to look at. I worked hard on my dreamcatcher trying to finish a little section each day. I loved watching it grow. It certainly was turning out to be a rather large project. Once the mandala was large enough to fit to the hoop I joined it to the hoop by sewing through the last round of stitches, as well as around the frame of the hoop. This took for some tedious work, as I wanted to make sure that I stretched the mandala evenly around the circumference of the hoop. The crazy thing was, that once I was finished sewing, I realised that I wasn't happy with how things were looking. 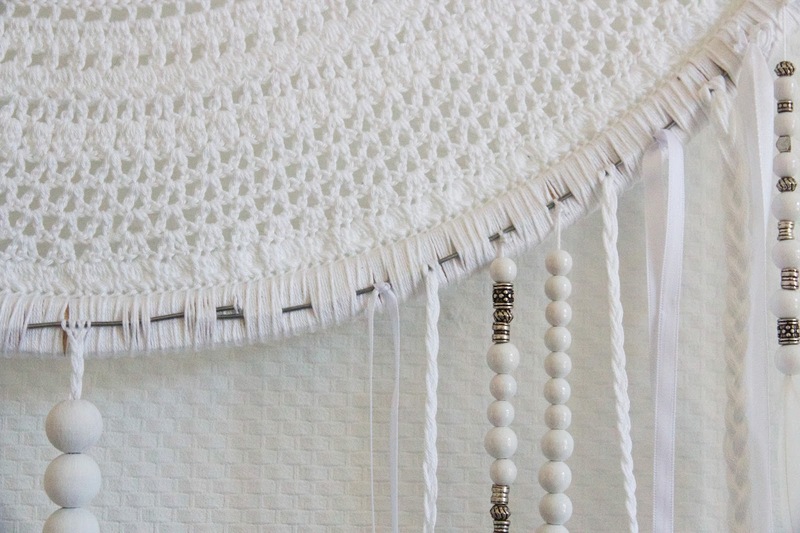 I didn't like how the wood of the hoop was looking showing through the stitched circumference of the mandala. Being the perfectionist that I am. 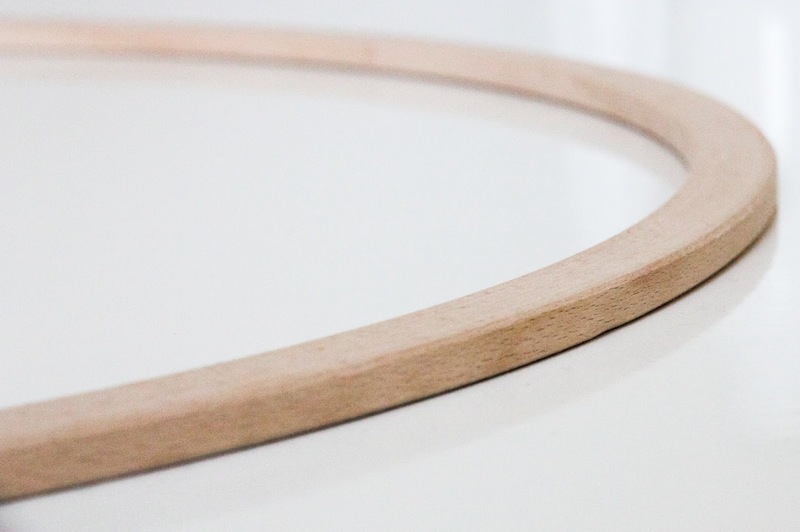 I took to my project with a pair of scissors, cutting through the stitching that joined the mandala to the wooden hoop. 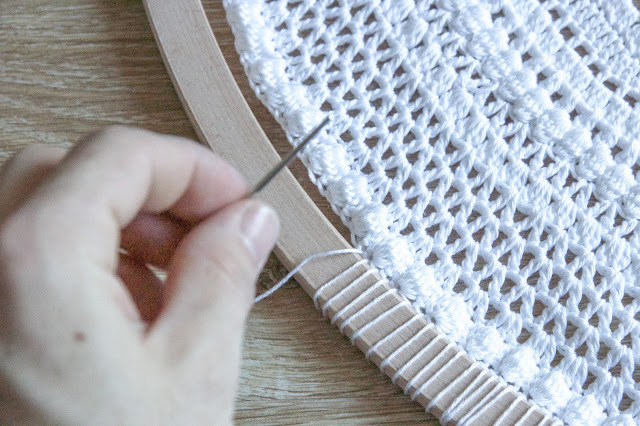 I decided to rethink think and chose to wind yarn all of the way around the circumference of the wooden frame. Covering the frame so that no wood could be seen. This ate up the yarn and took a little moment to do, but for me it was worth the perseverance. I then resewed my mandala to the frame, this time being much more satisfied with the outcome of my work. The hoop stretched the mandala out pretty well, but I still gave it a quick run over with the iron to steam out any bumps or uneven parts. With a quick whiz over from the iron I was super happy with the neat results. 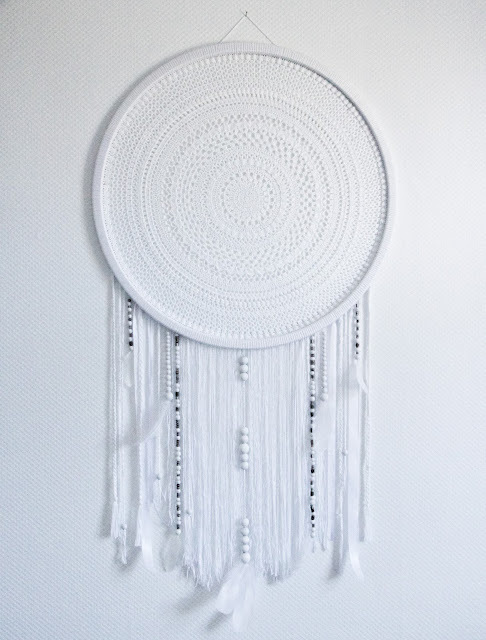 I raided my craft supplies for beads and feathers that I could hang from my dreamcatcher, trying to keep the white theme. I settled for some plain white beads, along with some larger wooden beads which I painted white with acrylic paint. I threaded the white beads onto some string adding some metal beads from an old bracelet I had hidden away in a drawer. These strings of beads along with some braid worked as my fringing. I attached the fringing to the dreamcatcher by threading a length of wire along the back of the frame. This made it easier to attach the fringing without disrupting the look of the covered frame. 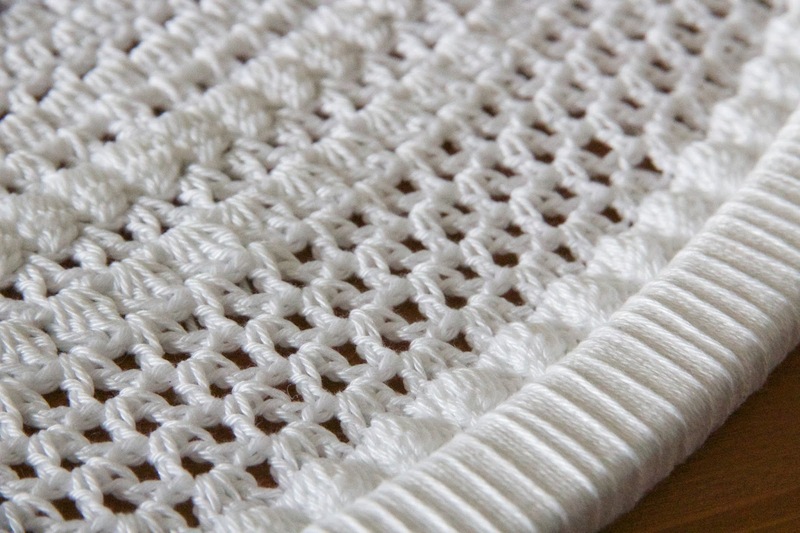 Finally I added some plane white ribbon, for some contrast to the yarn fringing. 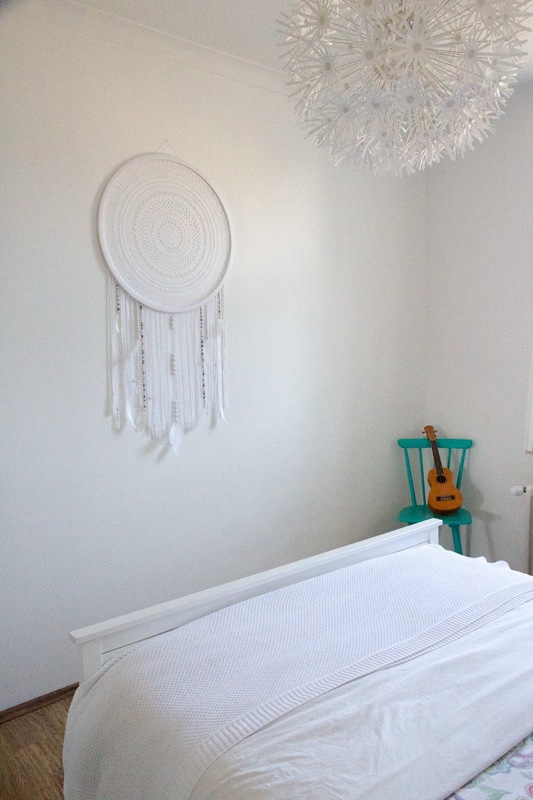 I was so totally over the moon with how my dreamcatcher turned out! it looked like a traditional dreamcatcher, matched the simple decor in the bedroom, but also made for a feature on the wall. Because of this project being totally white, it was a little tricky to get some decent pictures. But I tried my best as I wanted to show you all how it looked in the bedroom. Not the best pictures in the world but at least you can get an idea of the size of the dreamcatcher. I am so very happy with how this project turned out. It ticked every box, It was a joy to make, it ended up being better than I had anticipated and it seems to reflect my thoughtful mood at the moment. Wow, that's gorgeous. I love it! what an inspired artist you are, Matt !!!!!! Can you share the pattern please?? Oh. My. Word. It is so BEAUTIFUL! You both are so amazing at the craft. That is absolutely gorgeous! What a beautiful addition to your bedroom. You are so talented!!! Exquisite... just.... beautifully created. 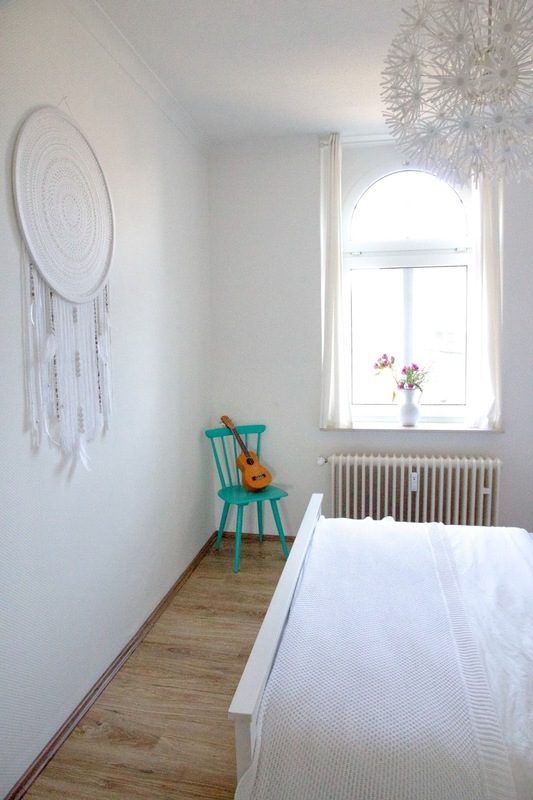 Love the white, suits your room perfectly. 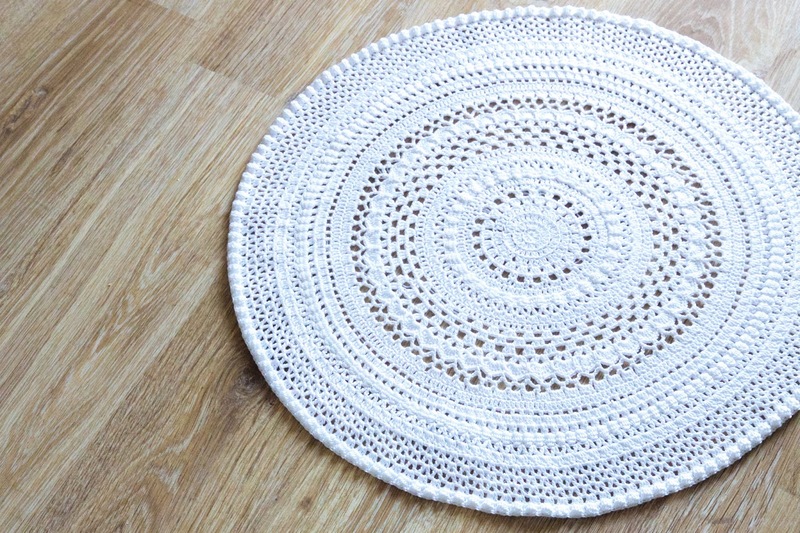 Will be watching for the pattern as I would very much like to try creating one of these for my home. I noticed the light fixture in your photos - can you tell us where you found this or did you create this too? Let's face it - I want my room to look just like yours!! Your work is amazing. I have always loved white on white. Wow that took some dedication! You have beautiful handwriting too! You did a wonderful job on it! Very beautiful and awesome crocheting! Magnifique ! C'est tellement joli ce que tu fais ! Et ce projet-ci est très technique... Merci de nous faire partager toutes ces belles réalisations ! Oh my! That is beautiful... cannot wait til you perfect the pattern. It looks divine on your wall. This is beyond stunning! 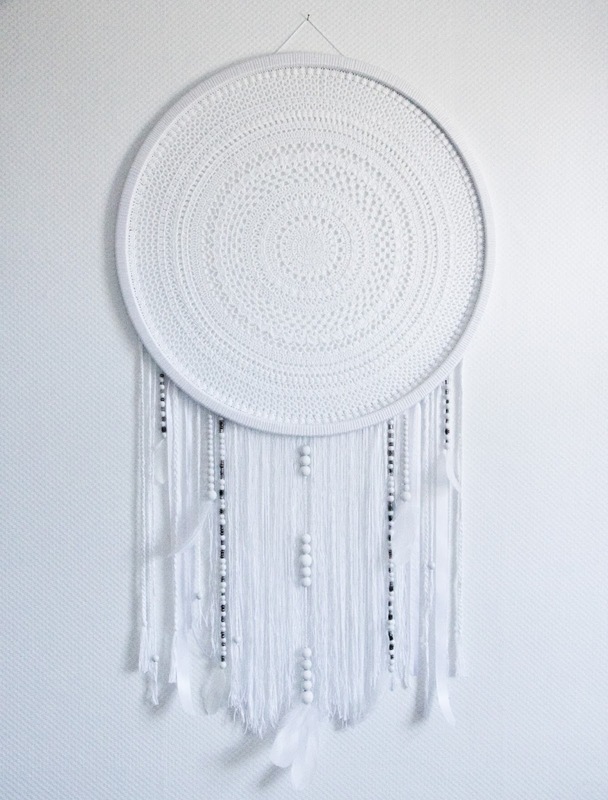 Dream catchers have always been on my list of would love to make... might have to bring it up on the to do list!